Barry’s research at UNSW (University of New South Wales), during 1998 to 2004, was in the field of artificial intelligence. His PhD was in the formation of low-level visual processing capabilities from initially random retinal arrangements. He also extended nested ripple-down rules to general predicates, placing RDR in a logic programing framework. Some work was also done on the control of a bi-pedal walking robot. Barry Drake is a successful researcher & experienced technologist. 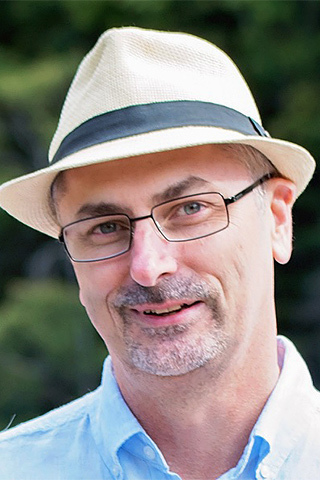 Prior to joining UTS School of Software, Barry was the Senior Principal Engineer and lead researcher for machine learning in Canon Information Systems Research Australia (CISRA). Barry has 13 years of experience conducting research with commercial impact within Canon for several multi-million dollar projects in Machine Learning and general data science and is the inventor on 20 filed patents. Barry aims “to make a significant positive impact translating Australian research into effective technology in business and government.” Over the years, he has undertaken business case and technology gap analyses for a large range of applications, including: new office workflow solutions, QA for print manufacturing, new features for professional DSLR cameras and video surveillance solutions. He has also produced detailed research project plans to which Canon committed and successfully executed within CISRA under Dr Drake’s supervision. Barry has particular interests in the domain of health, especially health systems and delivery of health services. Barry presents guest lectures in computer science and data science. Topics cover hashing, probabilistic graphical models, knowledge compilation and logical satisfiability. Diversity in machine learning APIs (in both software toolkits and web services), works against realising machine learning's full potential, making it difficult to draw on individual algorithms from different products or to compose multiple algorithms to solve complex tasks. This paper introduces the Protocols and Structures for Inference (PSI) service architecture and specification, which presents inferential entities—relations, attributes, learners and predictors—as RESTful web resources that are accessible via a common but flexible and extensible interface. Resources describe the data they ingest or emit using a variant of the JSON schema language, and the API has mechanisms to support non-JSON data and future extension of service features. Peters, MW & Drake, BJ 2003, 'The Representation of Space and the Space of Representation: a Cognitive Science Introduction to JIGSAW', Joint International Conference on Cognitive Science, Sydney, pp. 519-524. The question asked by this research is, "Given a set of signals, how can the spatial arrangement of the sources be automatically inferred, without knowledge of what the signal values are supposed to be?" Pursuing this question has led to the investigation of the phenomenon of spatial redundancy and the development of a computer algorithm, JIGSAW. JIGSAW is a novel method for the recovery of spatial information from a set of signals. It is similar in spirit to Self Organising Maps, but uses ideas from Multidimensional Scaling and Variograms. The developed algorithm embodies efficient methods for the incremental, adaptive construction of a spatial representation for signals. It is scalable and can deal with vast amounts of input data. JIGSAW has been extensively applied to the domain of computer vision where the task is to discover the relative locations of pixels in digital video. A particular application within this domain is the registration or merging of images from multiple video cameras. It has also been applied to the discovery of the relative locations of weather stations based on meteorological variables, and to the calibration of a robotic pan-tilt device to an image space defined by a camera. JIGSAW is designed as a general algorithm for any set of signals or data that exhibit redundancy. This work discusses the extendibility of JIGSAW to other sensor types, and to the analysis and presentation of vast amounts of data.